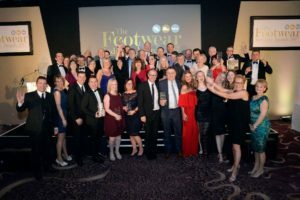 The 19th February marked the sixth anniversary of annual awards programme the Footwear Industry Awards. Designed to recognise the top footwear brands, retailers and individuals of the past 12 months, the awards are a stunning awards event attended by hundreds of key members of the footwear trade. After the conclusion of a dynamic first day at the Moda Footwear show, brand teams and retailers got suited and booted and headed over to the National Conference Centre, just five minutes down the road, for a well deserved celebration. After enjoying a glamorous cocktail reception, sponsored by Cherry Blossom, guests proceeded into the ballroom for the first of the awards presentation. 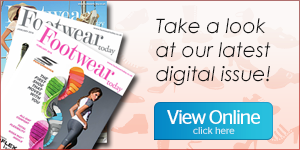 The Footwear Industry Award brand categories recognise footwear brands which have shown creativity, innovation and general excellence over the past 12 months. Guests then enjoyed a sumptuous three course dinner, with the retailer and individual awards following after the meal. The Footwear Industry Awards retailer categories are designed to recognise excellence in both independent and multiple footwear retailers. After the awards presentations, a game of charity ‘Black and Gold’ was enjoyed by all, with the lucky winners receiving Gold Tickets to Club Wembley and a 4-ball at the Forest of Arden Hotel. An impressive £1300 was raised by attendees in aid of the two nominated charities of the Footwear Industry Awards, Myeloma UK and Footwear Friends. Datateam Business Media is delighted to announce that the 2018 Footwear Industry Awards will return to the National Conference Centre next February. See you there!